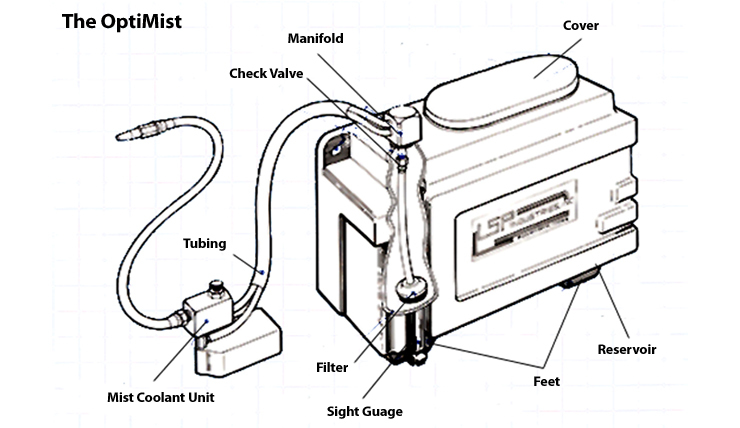 Mist Coolant | LSP Industries, Inc.
Economy, efficiency, durability and versatility are the trademarks of the LSP Mist Coolant Systems. 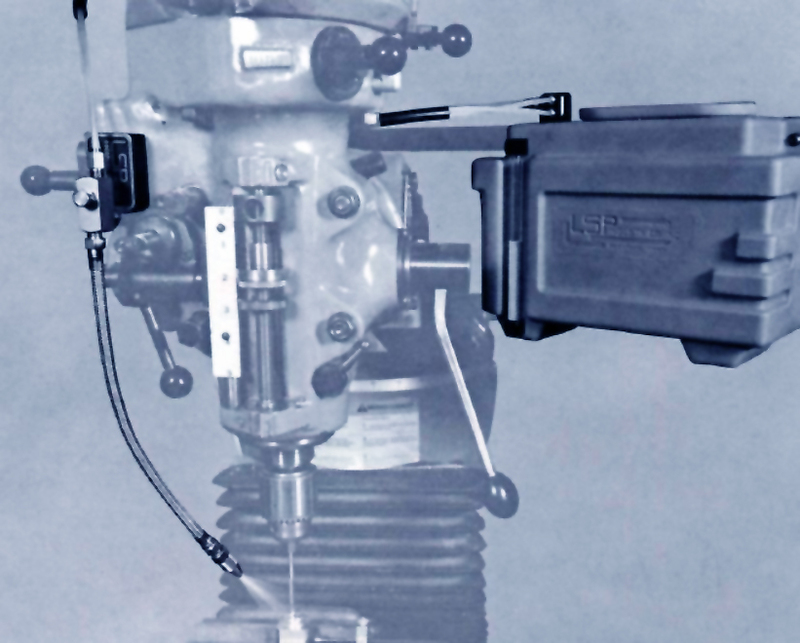 The LSP Mist Coolant System efficiently dissipates heat during HEAVY, high-speed cutting tool operations. The combination of air mixed with a small amount of coolant blows the chips away and the evaporation of the coolant on the hot tool cools the tool down. Whatever your metal removal requirements are, chances are there is a LSP Mist Coolant System that can dramatically improve the quality and productivity of your operation. Simply specify the system you want, select the components you need from our wide array of options and we'll deliver a package designed to meet your exact coolant needs ready for immediate installation. All units can be adapted for automatic or semi-automatic operation by adding an LSP air valve. How The Mist Coolant System Works. 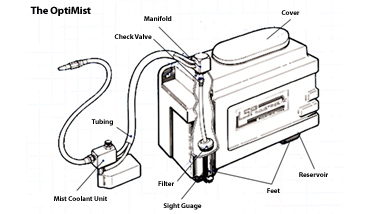 The LSP mist coolant systems use the Venturi principle for operation. When air is introduced to a typical unit, like the M-122 MagnaMist, and the air valve is open, it passes completely through and is released at the nozzle tip. 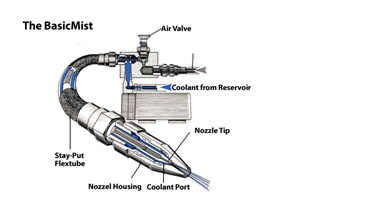 The air stream forms a "Venturi", creating suction that draws coolant from a coolant reservoir to the coolant port where it joins the air to form a mist spray. The force of the spray is easily regulated by adjusting the air valve to control both air volume and velocity. To adjust the coolant volume one has only to turn the nozzle housing. Economy, efficiency, durability and versatility are the trademarks of LSP Mist Cooland Systems. Simply specify the system you want, and then select the components you need from our wide array of options. All units can be adapted for automatic or semi-automitc operation by adding an LSP air valve. The OptiMist Package is unique in combining high performance with economy. Combining our dependable mist coolant nozzle with the cooresponding reservoir, we deliver a total system that is economical and convenient. Make OptiMist a permanent part of the machine tool, or use it as a portable system. The PowerMist provides perfect control over the misting range. Coolant is delivered to PowerMist nozzles under pressure without the need to go into pressurized vessels. 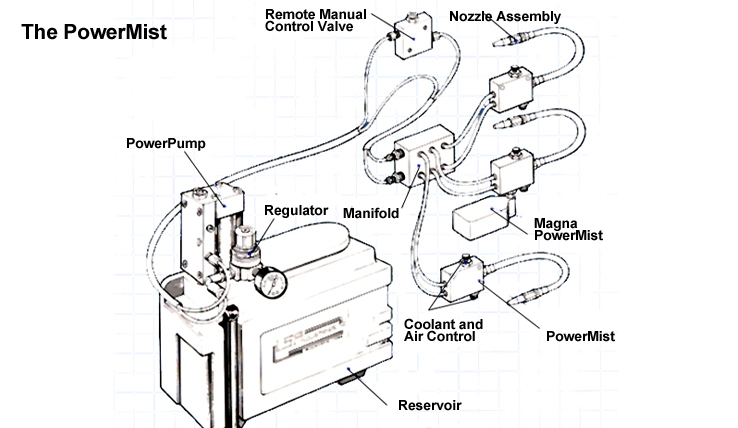 Up to 25 PowerMist units can be supplied with coolant from a centrally located PowerPump. Any or all nozzles can be operated manually or automatically.